Get ready for a festival of colour. This spring the Rijksmuseum’s gardens will burst with a brilliant array of magnificent tulips. From extravagant pink and yellow to mysterious dark purple blooms; from a field of flaming red tulips to a charming carpet of multi-coloured blossoms. 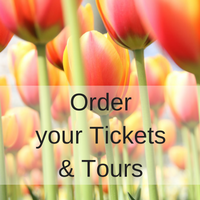 Every year many tourists visit the Keukenhof to see all kinds of tulips. But wouldn’t it be a great idea to see the tulips in the city of Amsterdam as well? Landscape architect Saskia Albrecht decided after visiting the Tulip Festival in Istanbul to organize a tulip festival in the city of Amsterdam. Just a little reminder that the National Tulip Day 2016 is held in Amsterdam this Saturday, the 16th of January.